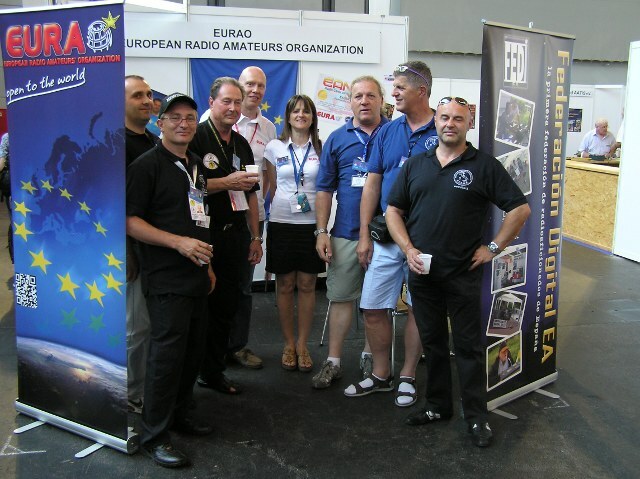 Official presentation of European Radio Amateurs' Organization in HAM RADIO show this year was a great success. A lot of visitors were very interested in our project: grouping alternative radio amateur associations and individuals from all over Europe, and beyond, with no limits, and willing to work together. The idea was launched on 2005 by F5RCS, Vincent, in order to give to ALL radio amateurs the opportunity of being listened and represented (notice that 60% average of hams do not belong to their "national society"). Until now several associations agree to make up EURAO, more information about them is found under "Members" menu option. Annual fee for member associations is 100 EUR (regardless of the size) and 10 EUR for individual members. Also extra details can be found in Transparency Register of European Union. Some funny pictures of our booth in HAM RADIO 2012 are on our Facebook page.